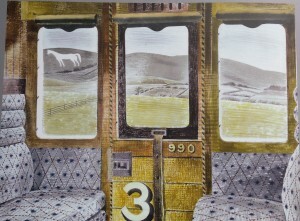 Eric Ravilious, sometime ‘Seurat of Sussex’, has long been one of my favourite ‘little known’ artists. He wasn’t unknown in his lifetime, his designs for Wedgewood and his engravings and illustration work made certain of that, but his career as a first-rate painter was cut short by the Second World War and his untimely death, aged only 39, in September 1942 on active service as an official war artist. 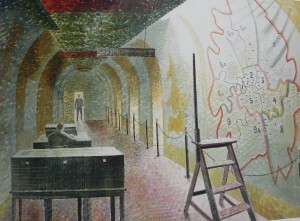 A major retrospective in 2003 at the Imperial War Museum brought him to the attention of the general public. His popularity is still rising. A student, and friend, of Paul Nash and his brother John , as well as John Piper, the Moores and Edward Bawden, Ravilious, apparently a boyish, light-hearted and charming figure, is part of that group of painters who captured a world about to change, just as the older Nash and his contemporaries had done before the First World War. 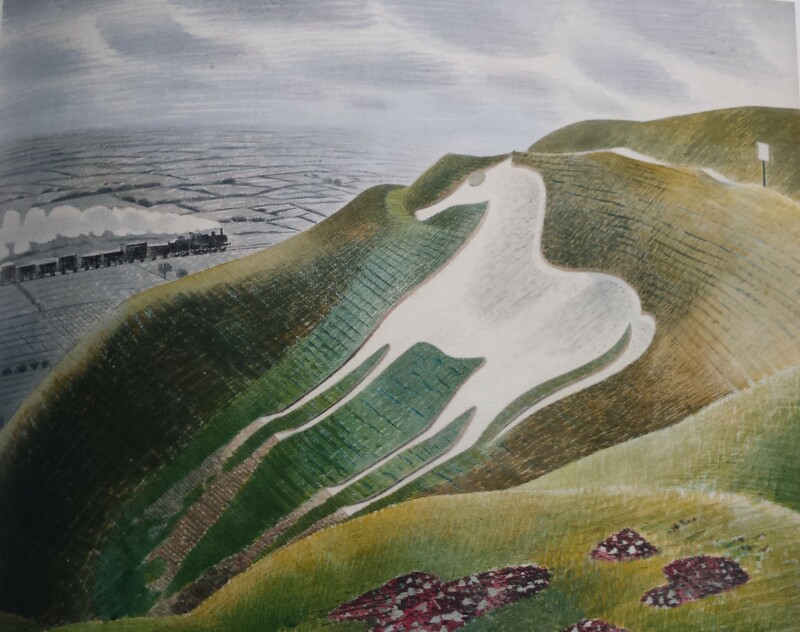 Ravilious’ water colours have the slightly self-effacing elegance of the inter-war English avant guard, stylised but not quite abstract. His works often have an air of gawky gentility, of bracing walks on the downs, steam trains and tea in the station buffet, although this atmospheric pigeon-holing belittles him, even as it explains, in part, his popular appeal. He is a better artist than privileged, if threadbare, Englishness might suggest. The son of a servant and a salesman, it was his talent which gained him entrance to this milieu, his early drawing skills winning him a scholarship to Eastbourne School of Art and then the Royal College. And there is more to him than pretty country scenes. Some of his works, which he very rarely explained, have a disconcerting, even sinister edge to them, suggesting an interior depth of meaning. They are often ‘off-centre’ in some way and full of openings, doors and windows and receding, or skewed, perspectives, which begin to recede and are solidly blocked. 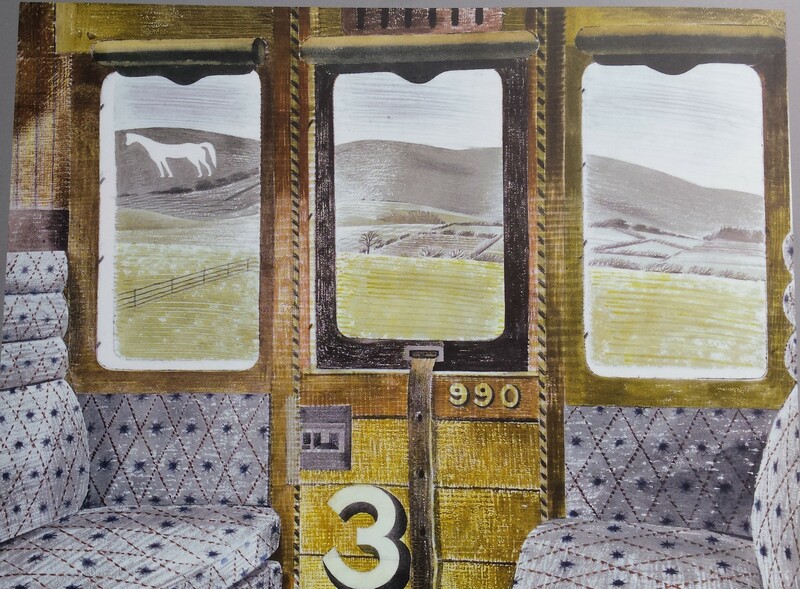 The detailing in his paintings is remarkable and closely allied with his love of pattern, be it in upholstery ( see Train Landscape 1940 ), the soil and the water ( see Cuckmere Haven 1939 ) or through structural details such as the receding telegraph poles in Wiltshire Landscape, 1937. 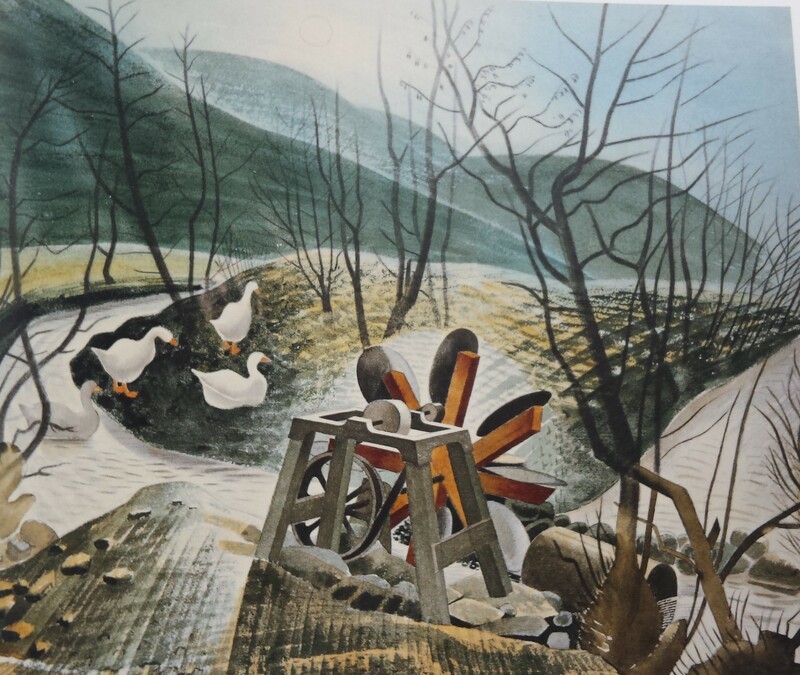 He also loved what would now be called ‘found objects’ and he often painted them, especially man-made objects in a pastoral landscape, like The Waterwheel, 1938, in Capel-y-ffin. He described this water colour as ‘a bit Chinese’. Living first in Kensington and then in Sussex, he certainly wanted to travel further than Wales, although, until the war, he didn’t do so. 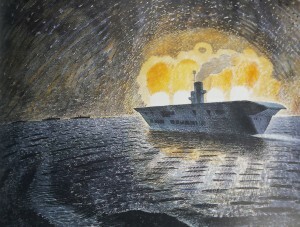 It was when he was assigned as an artist to the Royal Navy that he visited Norway, the Arctic Circle and France. Guns, propellers and aircraft displaced the junk-yard objects previously found in his works and he transferred his love of explosive light – fireworks, light houses – into paintings of gunfire ( see HMS Ark Royal in Action, 1940 ). 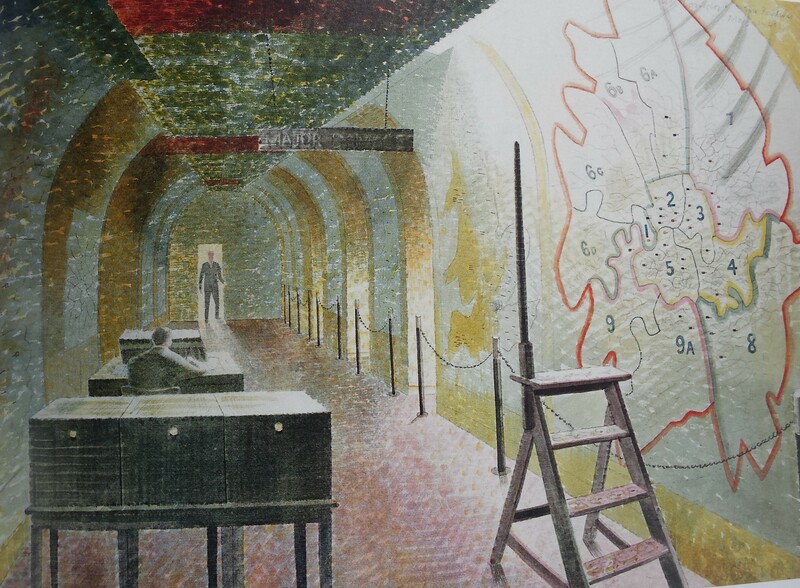 He also captured war-time interiors, the underground bunkers with strip lighting and wall maps, the preserve of uniformed clerks, often women. The photographs in this post do not do his restrained palette and minute detailing justice. Go and see the pictures for yourself. At the Dulwich Picture Gallery until 31st August 2015, tickets £12.50, £7 concessions, this exhibition is definitely worth a visit, but I strongly recommend that you purchase timed tickets if you want to see it, the queuing/waiting time when I visited on a Wednesday afternoon was over an hour. In its last two weeks the exhibition it will be even more crowded. This entry was posted in Art, Culture Vulture and tagged Worth a visit by juliej. Bookmark the permalink.